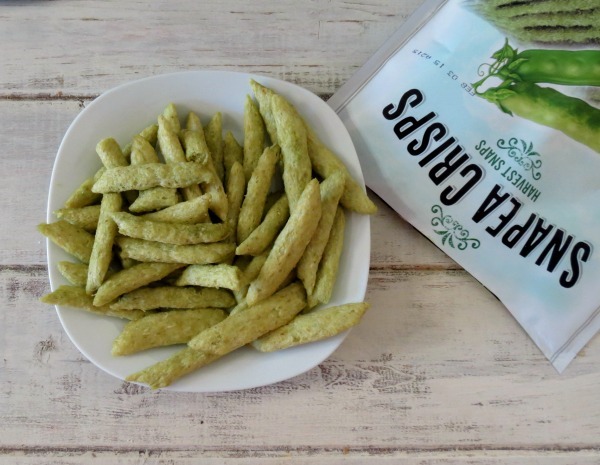 Today I teamed up with SNAPEA CRISPS BY Harvest Snaps to share with you a fun healthy snack. I have been a fan of Harvest Snaps for a couple of years now. They are light, salty, full of fiber, protein and gosh darn, they are just plain good. Yhey come in a lots of great flavors like my personal favorite Lightly Salted. 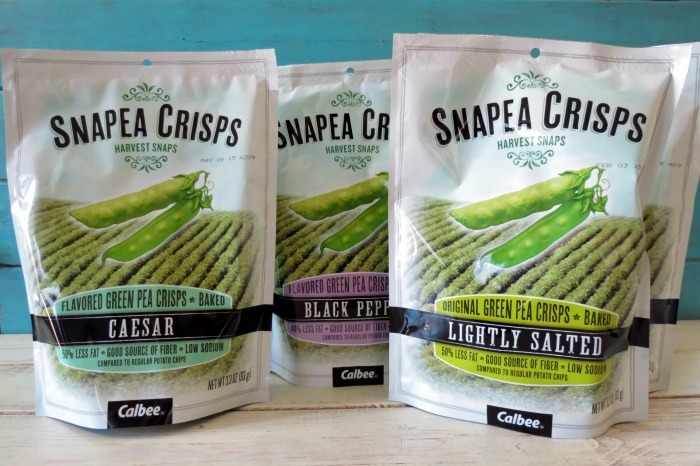 SNAPEA CRISPS are baked not fried, gluten free, and GMO Free. They are made with green peas and only contain 4.5 grams of fat, 4 grams of fiber and 5 grams of protein. I have had the honor of trying all of the different flavors and I love the Caesar, but the traditional person that I am, my heart goes out to the Lightly Salted. These make for a great snack, that is completely guilt-free. Each container contains about 3 1/2 servings and come in at about 110 calories for 22 crisps. If you happen to eat the whole bag, like I did, I still don’t feel bad! Way better than potato chips. They kind of remind me of puffed corn, but in a pea style. I don’t know how they do it, but I am happy that they did. These are an amazing snack. Harvest Snaps is kind enough to let me do a GIVEAWAY. You will win a Harvest Snack Gift Pack. All I need to know is which flavor would you like to try? You can get more information at Harvest Snaps website. P.S. I’ll pick a winner this week! I love the Wasabi Ranch!! I’d love to try the Caesar one, although I’m pretty sure they’re all good!! I love the lightly salted but would be interested in trying the wasabi ranch. The lightly salted sound good to me! The Wasabi Ranch sounds goooood! Lightly salted and Wasabi Ranch both sound good. The wasabi ranch sounds really good! I would love to try the classic Lightly Salted as I’ve never had a snapea crisp! I LOVE caesar, but the wasabi ranch looks delicious too! I belive you and would love to taste the lightly salted. They all sound good to me. I love all your recipes Jennifer, so I would like to try your favorite the lightly salted. I’ve had the classic, but the Caesar sounds great! Lightly Salted is my top pick. Thanks! I would love to eat the Wasabi Ranch. I have tried the lightly salted and LOVED them. I didn’t realize that they came in other flavors. They all sound good, but I think I’d most like to try the black pepper. Black pepper, I love black pepper on everything! I want to try the Tomato Basil Lentil snaps. Yummy! I’d liek to try the caesar flavor! I’d love the lightly salted! Id love to try the lightly salted! Absolutely the ceasar! yum yum!! I would like to try the black pepper! I’d like to try Lightly Salted. wasabi ranch would be great! I would love to try onion thyme! The Caesar ones are delicious, and I just tried the tomato basil (must be new?) the other day and they were fantastic! I’d like to try the caesar flavor! I love the Wasabi Ranch! The Caesar are fantastic!!!! But the Wasabi and lightly Salted are divine too! Just ate the whole bag last night!!!! !